Lynx Cave is situated about 100 metres down a gully below the escarpment. Getting to it requires some scrambling in places, and a small waterfall has to be negotiated in summer. 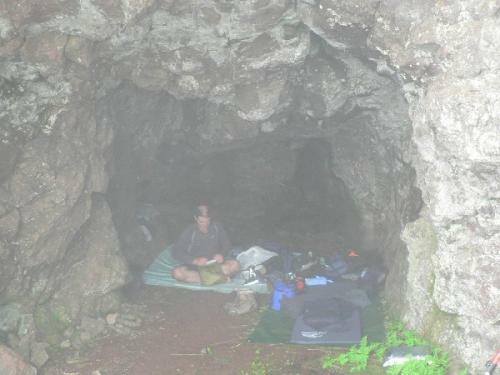 This is a miserable cave in summer because it is very wet, muddy and full of drips. However, at the height of the dry season it can provide excellent shelter, since it is a tunnel about 7 metres deep, 2,5 metres wide and just under 2 metres high. The cave is named after a large, heavily-built cat - something equivalent to the American bobcat - with a short tail and tufted ears. The lynx is more commonly called a caracal, and its Afrikaans name - rooikat (which translates to "red cat") - describes its reddish-brown coat. Though they still occur in the Natal Drakensberg, they are very seldom seen. Despite their reputation for ferocity, they are harmless to humans if left alone. The sleeping area is almost perfectly level but is likely to be damp even in winter. In summer it is a quagmire. 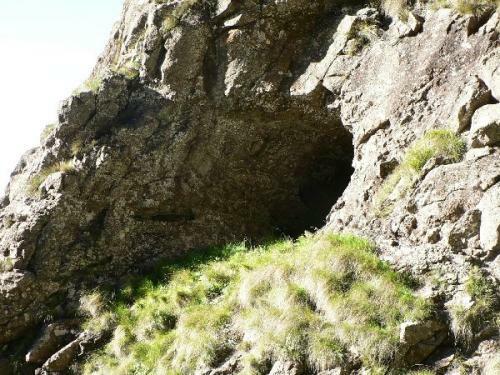 At the time of year when the cave might be dry enough to use for shelter, there would be little or no water flowing in the stream below the cave, and you would need to go further back into Lesotho to fetch some. 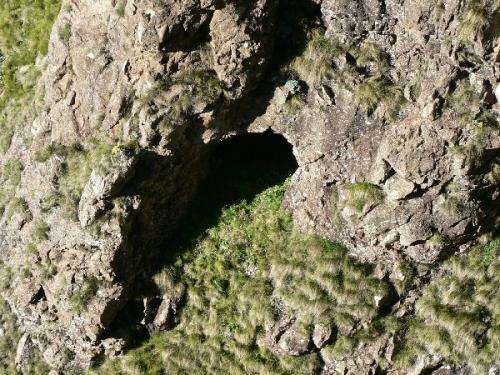 The cave's low height and good depth should provide adequate shelter except maybe in poor weather driven from the east. The cave looks out onto the cliff face of the gully, but a peek around the entrance offers quite a good view over the Loteni area.